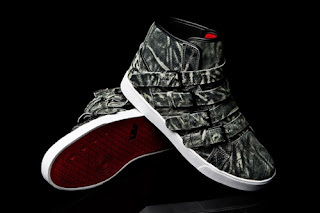 If you are in the Los Angeles area tomorrow (Tuesday the 18th) make your way over to Factory 413 for the exclusive launch party for the DJ Steve Aoki "Wildlife" Strapped Supra. The event will feature music by DJ Benji Madden and Laser Beam with eats courtesy of Frank's. The NS collaboration features a wildlife upper - complemented by the classic black, red and white accents.